Thread: Wife's gun is finished! What a difference! It is like a different gun! He installed a new spring set, polished up a couple rough spots, tested the gun and sent it back to me. My wife absolutely loves this gun and yesterday she and I put 300 rounds through it with zero complaints. Tom replaced the hammer spring with a 14 pound spring and when he returned the gun to me he included a 13 pound spring in case my wife needed it lighter. His prices are more than fair, in fact, I have spent more on a single brick of .22 match ammunition than he charged me to do the gun and his price included labor, parts, and shipping! 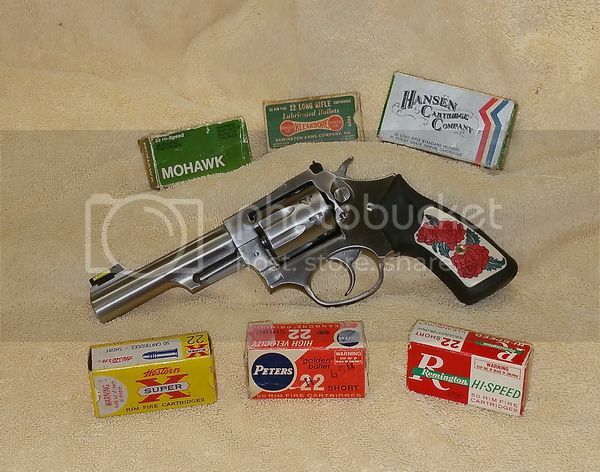 I did one more thing.... my wife owns a S&W 686 4 inch .357 and a S&W snub nose model 38 airweight. She has owned both guns for probably 30 years or more. In 2000 and then 2001 I had matching custom grips made for both guns. 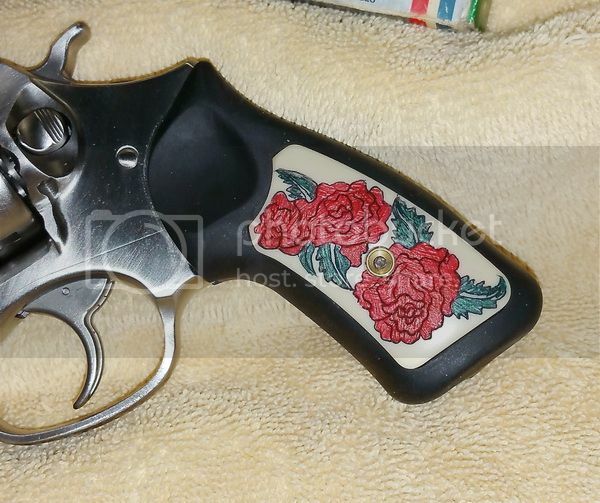 The grips are faux ivory and they are hand engraved with red roses into the grips. my wife's name is Rose. Anyway, I contacted the grip maker who did both sets of grips for me and asked him to do a matching set for her new SP101. They arrived about a week before the gun came home and they look great, according to the wife, on the gun. That sounds like a real nice gun, Don! Nice project!! It would be really interesting to see the engraving process!